Having just experienced a taste of civil war life through the eyes of those participating in last week’s reenactment in Windham, I felt compelled to see this movie. Another valuable reason is because this film is based on a true story. Director/writer Gary Ross (Hunger Games, 2012) brings to life the anguish of war as well as personal lives off the battlefield. This was accomplished through the use of cleverly inserted archived photographs from that war and the era in general. The film does jump 85 years later once in awhile but this too is accomplished without causing confusion to the viewer. 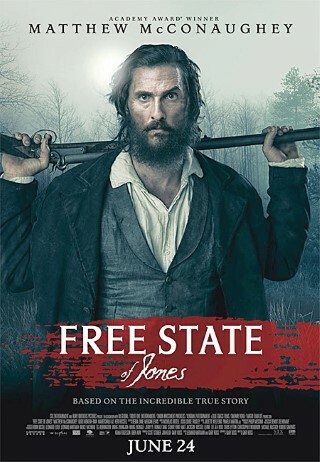 Set during the Civil War, Free State of Jones tells the story of defiant Southern farmer Newt Knight (McConaughey) and his band of extraordinary armed followers against the Confederacy. Joining together with other small farmers and local slaves, Knight instigated an uprising that led to the secession of Jones County, Mississippi from the Confederacy, creating a “Free State of Jones”. Knight continued his struggle, distinguishing him as a compelling but controversial, figure of defiance long beyond the war. Gugu Mbatha-Raw (The Whole Truth, 2016) is brilliant as Newton Knights’ savior. McConaughey too is impressive, effectively showing a sensitive side as well as a man with a painful mission. Other notable actors i.e. Mahershala Ali (House of Cards and HungerGames: Mockingjay I and II) and Keri Russell (Dawn of the Planet of the Apes, 2014) round out an incredible cast; each feeding off one another’s talent. Rated R, the film begins with the bloody horror of battle, leaving theater goers with a sense of shock and remorse. Add to this the captive cinematography, shot partially on location, by Benoit Delhomme (The Theory of Everything, 2014) and what you end up with is a documentary on steroids.